......Piccalilli Pie: Evil Horse-Poisoning Invader...or Not? Ever since the summer of 2010 when I discovered that what I thought was a beautiful and rare orchid growing in my garden was actually a high-priority nonnative invasive weed called Himalayan balsam, a plant that according to state instructions should virtually be locked in an airtight chamber and launched into deep space, I have viewed new plant volunteers popping up in the garden with a jaundiced eye. Is that pretty little blossom a native species that sprouted, liked what it saw, and decided to thrive? Or is it a green monster that will overwhelm all my other plants, clamber out of the yard, and lay waste to local habitats, possibly threatening to take over the Pacific Northwest as kudzu has claimed the southeast? Will some sort of secret gardening Polizei discover that my garden was the source of this herbaceous tsunami? I couldn't bear to have all those green thumbs pointing at me accusingly. So when I noticed plants with cheerful blue flowers and hairy green leaves growing around the young maples near the back fence, I wasn't sure whether to be pleased or concerned. Should I practice "better safe than sorry" and yank them out? Hmm. I have an embarrassing memory of heroically ripping tall purple blooms out of my first garden during my first year in Seattle, thinking that I was nobly saving wetlands everywhere by ridding the world of the horribly invasive nonnative purple loosestrife. By the following summer, with a year's gardening experience to my credit, I knew that I'd actually destroyed a lovely bed of foxgloves--also not native, but not a wickedly invasive and harmful one. This year's mystery plant reminded me a lot of a forget-me-not. Small clouds of tiny forget-me-nots drift across my garden, all descendants of a variety purchased at local garden shops. But this new plant was much bigger, a hefty, fuzzy whorl of leaves nearly as big around as a full-grown small species of hosta. It wasn't until its flowers opened about two weeks ago that it hinted it might be related to the petite forget-me-nots. Not half an hour after examining the flowers this weekend, on a beautiful, sunny Sunday afternoon, I sat down with a cup of coffee and a library book called The Paper Garden by Molly Peacock. It tells the story of one Mary Delaney, who invented the art of collage in 1772, at the age of 72, when she began snipping and pasting paper to produce botanically accurate "floral mosaicks." I turned page 35 to find a plant much like my new volunteer staring back at me, as if Mrs. Delaney had returned from the beyond to help identify it. 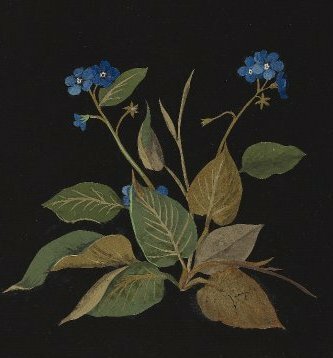 Her plant was a Hound's Tongue, Omphalodes verna, also known as creeping forget-me-not and Mary Blue-Eyes (and, oddly, the unattractive "creeping navalwort"). ...there's a houndstongue on the Washington State noxious-weed list. It poisons grazing animals. It produces burr-like seeds that cling viciously to fur, wool, and pants legs and can injure animals' eyes and lips. It contaminates hay. It's supposed to be destroyed. Yikes! Pacific Houndstongue grows in wood and forest fringes from southern British Columbia to central California, so it's in exactly the right place to flourish. The name "houndstongue" was applied to this plant because of its resemblance to its European cousins, whose name in turn was inspired by the shape of the leaves. This probably suggested the "like cures like" belief that the plant could cure rabies caused by dog bite. Field guide said houndstongue flowers had 5 petals; first one I saw had 6! Houndstongues and forget-me-nots all belong to the borage family and contain potent alkaloids strong enough to harm the livers of grazing animals (and humans). According to the Audubon Field Guide to North American Flowers, native Americans once used brews made from the root to treat burns and stomachaches; I don't know if the root is less toxic, or if, like any medicine, a certain amount aided in healing, with more than that dose causing lethal side-effects. Another European name for houndstongue is "rats and mice," a reference to the plant's musty smell--or what I guess is a musty smell, because (a) the plant in my yard doesn't seem to smell at all, and (b) I don't know what rats and mice smell like, and my cats aren't saying. One source claims that the leaves and roots can be used to repel rats and mice, so maybe the plant really isn't redolent of rodents and is actually named for its vaunted rodent-repellant powers. Until otherwise notified, I'm going to assume my volunteers are Pacific houndstongues and will allow them to spread freely. Unless it turns out they actually attract rats and mice. Or hounds. ***This just in, as I have been "otherwise notified." Jane Badger of the blog Books, Mud, and Compost. And Horses alerted me to the existence of alkanet (a.k.a. evergreen bugloss),a western European species that was introduced to the UK and the US, where it's especially abundant from British Columbia south to California, just like the native species of houndstongue. Also like that plant, it's a member of the borage family and has the same sort of "forget-me-not" flowers. It's fond of damp, shady sites. Fortunately, as far as I can tell, even though it is not a native plant as I'd hoped, it does not appear on the King County noxious-weeds list, though an annual species in the borage family does. I'm guessing that the shrub I've seen blooming along I-5 and in vacant lots is also a noxious weed, but I love its cheery yellow flower and am tempted to steal out into the night with shovel in hand and bring one home for my yard. Hi Rachael, yeah, I think that's Scotch broom. Really noxious and invasive. The reason invasives grow so well is there's nothing here to eat them! Hmm, for cheery yellow flowers without Scotch broom, you might try various evening primroses...kerria...a golden chain tree...if you don't mind orange, then California poppies are great...none of these are natives but they don't overwhelm like Scotch broom does.